Shanghai Garden does not follow the typical suburban formula for Chinese restaurants of providing mass quanties of food at cheap prices. In fact, it is not really a suburban restaurant, but is an offshoot of one of the most popular establishments in Seattle's International District. The lunch menu is very limited, mainly consisting of the American public's favorites such as kung pao and sweet and sour whatever. I did find the kung pao, though, to be excellent, and I imagine other lunch specials are good as well. The real treasures, though, seem to be found on the dinner menu, which is priced quite a bit higher than the lunch specials. The restaurant specializes in several dishes that come from the region of Shanghai, and they are well worth seeking out. Shanghai cuisine is known for its absence of chiles such as would be found in Hunan or Sichuan cooking. It was somewhat hard for me to conceive of mild Chinese dishes giving as much satisfaction as the spicier ones, but the ones here have been some of the best I have experienced. It is no wonder that I observed many of the patrons having pleased and astonished looks on their faces while partaking of the food. Shanghai Garden offers several versions of Hand Shaven Noodles that offer a good start in sampling Shanghai cuisine. The noodles I tried were thick and flavorful, mixed with fresh vegetables (the staff obviously frequents the Seattle area markets to get the freshest ingredients). The key to the dish, though, was the sauce. It had a light, delicate flavor that so enhanced the other ingredients that this dish should be considered a work or art (and it was as much so visually as in flavor). The Bean Curd Sheet Roll, however, was probably even more impressive. This is a dish I had eaten at Disney World in Orlando, and until now had been unable to find anywhere else. 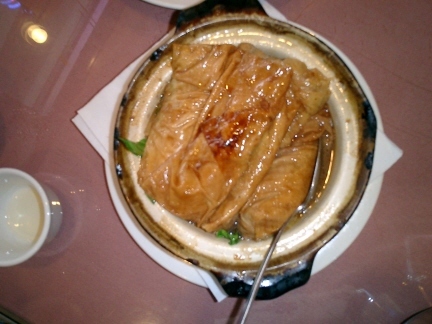 Six rolls are served in a hot pot, with a brown sauce and bok choy on the bottom. The dish is not spicy, and is vegetarian unless the chicken version is ordered. It is hard for me to be impressed by Chinese dishes that do not contain the added dimension of flavorful and piquante chiles, but this dish was a pure delight for about five out of the six rolls until I became so stuffed I was ready to share the last roll with anyone who would take it. Although this is one of the best Chinese dishes I have ever eaten, I would say it is probably meant to be shared in a Chinese style banquet rather than eaten by one person as a meal. The Bean Curd in Chef's Special Sauce was even more flavorful than the sheet roll. This had a delicious sauce that would be hard to find anywhere else. The only problem was that it lacked vegetables, and had so much tofu that it was somewhat hard to finish. Like the sheet roll dish, I think I would recommend this served family style along with other dishes. I will have to say, though, that this is one of the best Chinese dishes I have tried anywhere. The Chicken with Garlic and Ginger is another offering in the all-star lineup of authentic Shanghai style dishes. This had a very flavorful, somewhat sweet sauce similar to the Chef's Special Sauce. With strips of ginger and whole garlic cloves, however, it is obviously not something that has been altered for the mass market. This is one of the two or three chicken dishes that the restaurant says is from Shanghai. 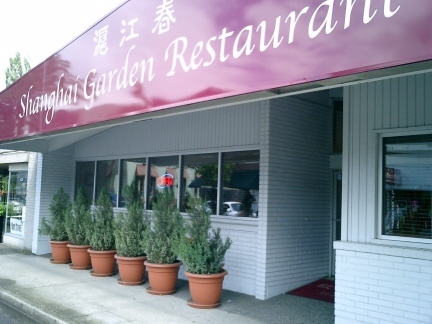 Shanghai Garden has proven that it is not necessary to go into Seattle for an authentic and delicious Chinese meal-- you just have to dig a little bit deeper than the lunch specials and the common items you can find at virtually any Chinese restaurant in suburban U.S.A.